The club’s annual membership fee falls due in January each year. To renew with a single annual payment members must pay the membership fee before participating in their first training session for the year, and no later than Jan 31st. Alternatively, membership can be paid by monthly direct debit. A direct debit form must be completed within 2 weeks of your trial session in order to continue fencing. More information is available on the Membership page. 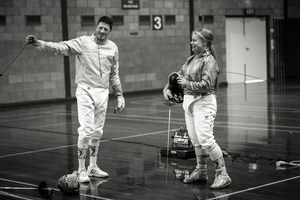 Visitors are welcome at all club sessions, however, fencers must be affiliated with their state or national fencing association. Visitor fees apply. A full set of fencing kit is not cheap, so the club provides equipment for members to use until they are able to buy their own. There is no time limit, but we do expect people to start buying their own kit and free up resources for new members when they are able to do so. Club equipment is shared equipment – if more people want to use it than is available, you are expected to hand it over without prompting after your turn. Please treat the equipment provided with respect, and put it away neatly when you are finished with it. The club provides assistance to members wishing to attain coaching or referee qualifications. Please contact us for more information on how we can help. Club members can also request a free development plan at the start of each year from the head coach. – No fencing in shorts, the legs must be covered. – If not wearing fencing breeches, ensure that your pants do not have any pockets/buckles/straps/etc. that a blade could catch and break on. – Always wear a mask when fencing and keep weapons pointed at the floor when not fencing. – Keep equipment tidy and out of the way when not in use.